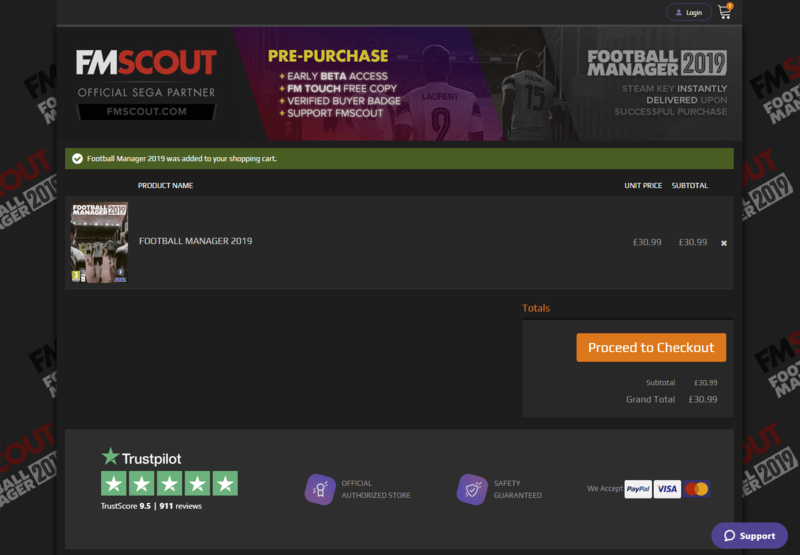 Pre-Purchase Football Manager 2019 from our store to receive access to the beta version approximately 2 weeks before the final game release! It's safe to say this has now become a tradition. Sports Interactive involve their loyal customers in the final beta testing stage of the game that last approximately 2 weeks. Beta is a full game, just not the final product. 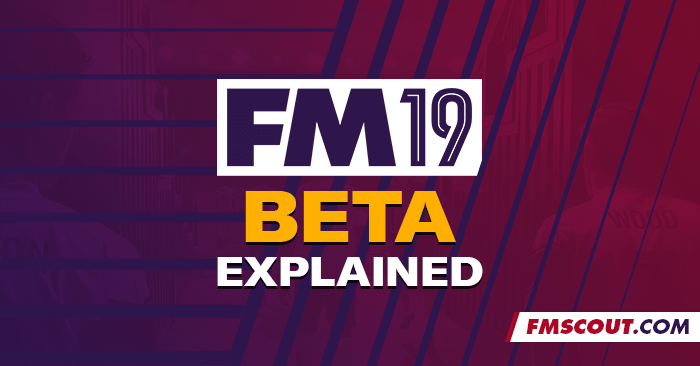 Early access to FM19 is in fact a special reward for people who pre-purchase the game from our store – you'll get access to the beta version of the game just over 2 weeks upfront, plus a gift copy of FM Touch for desktop computers. Plus a couple of fmscout exclusive rewards. What is this beta version? Beta version will be very close to the final game. All game modes, including Network Games and the Fantasy Draft mode will be available to play. However, if the game proves unstable, online modes will be disabled with a patch. Saved games will be compatible with the final game. The game will automatically update to the final version on the official release date. One main limitation: no pre-game editor, and no resource archiver. Who can get access to the Beta? Anyone who pre-purchases the game through our official store will be given a key which will grant early access to the game. The early access period will be just over 2 weeks – so allowing people who pre-purchase to start playing the beta game roughly two weeks before its actual release as a product. No, it's NOT the demo. It's a pre-release version of the game and you can play as much as you like, there is no season limit or anything. The demo will be released either on November 2nd or shortly after. What do I get from you when I pre-purchase? Your code will be almost instantly available to you on our 2game store. Upon successful payment, wait a few seconds (average process time is 28 seconds). 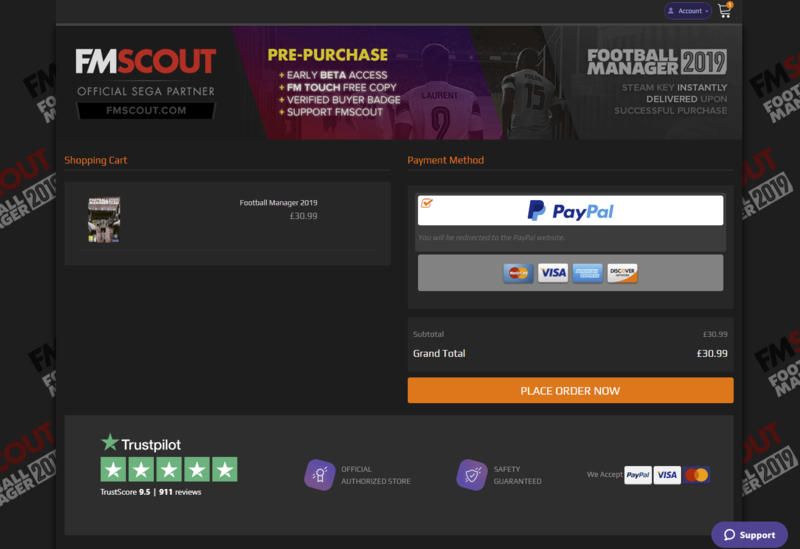 Then go to Account > My Orders to find your FM19 Steam key; there will be a button "Click to Reveal Code". How will I know when I can access it? We expect the early access to be available on or before October 19th, which means 2 weeks prior to the actual release date of the game. Our guess is for the 17th or the 18th. Keep checking our news homepage for information about the live date for early access. To access the beta you will need the Steam activation code from our store. Once you have the code, you can redeem it on Steam and get the game on your Steam Library. You will need your code and internet access in order to begin the install. How long does the beta code take to install? This will very much depend on your internet connection speed. For example with an average speed of 2mb/s it should take 20 minutes. Please note however this is only a rough estimate and it will vary. Yes, all game modes, including Network Games and the Fantasy Draft mode will be (initially) available to play with the pre-release beta. How much space will the game take up on my PC/Mac? Around 7gb of hard drive space will be required to install the game. What happens when the game is released? Your game will automatically update from beta to final version on the launch day (November 2nd). What happens to my beta game post release? Your beta game will remain as a saved game and you'll be able to continue playing post release. The price is set to £30.99 for UK and €35.39 for EU. 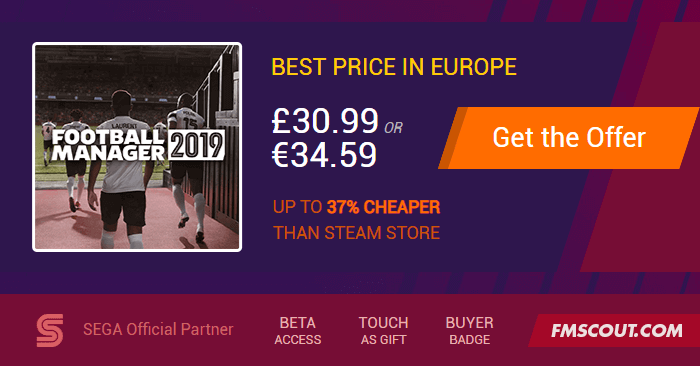 If you live outside Europe, you will get a price of $44.99. 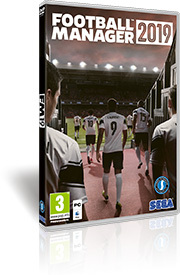 1) Clicking the "Add to Cart" button will take you to our 2game store and add FM19 to your shopping cart. 2) Click the "Proceed to Checkout" button. 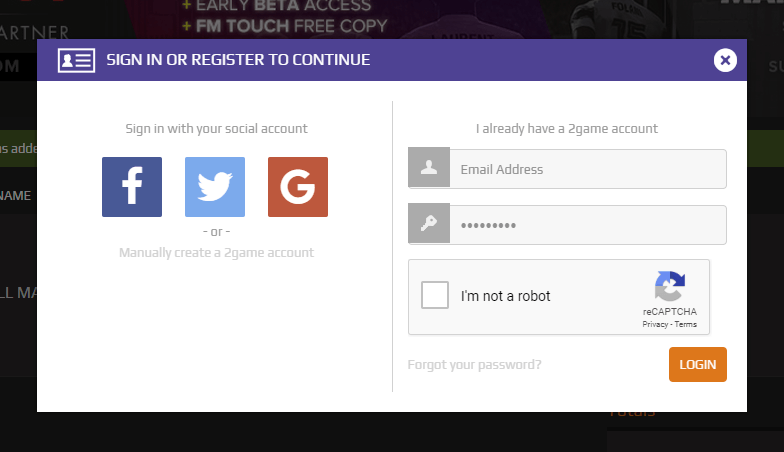 You'll be asked to sign in or register on 2game. If you already have an account there, sign in with it. Otherwise register with Facebook, Twitter or email. 3) Once signed in, you'll be asked to select your desired payment method to complete your order.